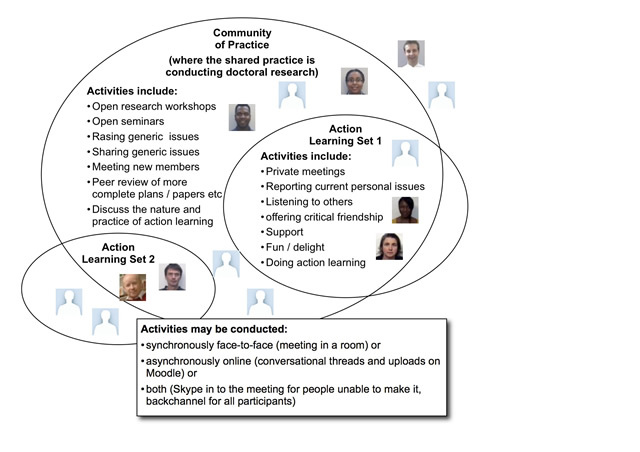 Had a very useful meeting in University of Bolton with colleagues intent on developing a community of research – the diagram illustrates our joint efforts to come to terms with this idea, but it does not clarify the concern I have, which is to be confident who is ‘in’ and who is ‘out’ – I believe to have a conversation that supports learning, you have to feel ‘safe’ with your audience to take risks with ideas. This is exacerbated when you are online, since the audience may be unclear or grow later to include people your are not so sure about! I have been working part-time in the Institute for Educational Cybernetics (IEC) at the University of Bolton for the last two years, after seventeen years at Ultralab. I work on the IDIBL project with Stephen Powell and Mark Johnson – an enormous pleasure to refine and improve the Ultraversity model we created in Ultralab at Anglia Ruskin University in 2003 and which is still running. The model is of work-focussed action inquiry as a means to learning, supported by colleagues, online community, facilitators and experts. • assessment to fit creative and work expertise. A competitive bursary scheme for PhD will help lower the costs for successful applicants. I have been reading the report ‘On-line Innovation in Higher Education‘ submitted by Sir Ron Cooke to John Denham recently and I’m not impressed. It seems to be but a variation on the ‘content is king’ theme and, by its own standards, seems to miss many points. 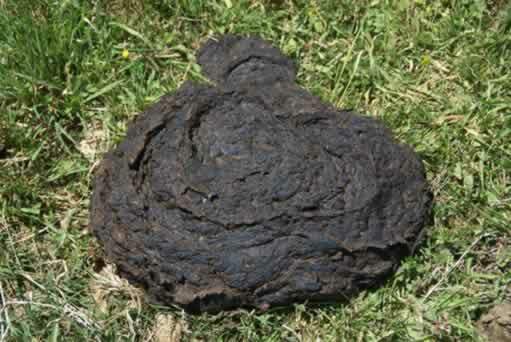 The title of this blog ‘Content is muck’ is intended to disparage this approach and at the same time recognise the importance of high quality, accessible content as a fertiliser for the growth of knowledge amongst learners. So where in this document is a vision outlined – where is it to come from? I (and many others) would be happy to offer one! But seriously, this is the moment and little here is visionary. The difficulty I have with this is the way in which we go about catching up. We should be careful not to spend too much money on material which becomes out-of-date within a year, is specific to particular courses, contexts and levels or fails to enhance the creative rôle for the learner in developing their own knowledge. The diagram referred to shows some ICT tasks in a grid with four quadrants – the top left shows tasks which are ‘”Familiar” / “Not comfortable using” and includes “Using social networks such as Facebook as a formal part of the course”, but the task “Using existing online social networks to discuss work” is shown in the bottom right quadrant “Unfamiliar” / “Comfortable with using” – how can this be, what do they mean? Sadly the document lets us down here, with no reference to a source, unlike the bulk of the work. A report of this significance needs to be of the highest quality of it is to be convincing. I agree in part, but what does “tend to learn almost entirely as a distance” mean? Is it not the case that learning materials and support for face-to-face learning should be of similar standard? The unspoken assumption is that learning at a distance is solitary and thus the materials and support must compensate for the lack of ‘learning conversation’ – this is simply not the case in the modern social web. We have had extensive experience over five years of fully online provision in the Ultraversity project where “purpose written, online materials” have been minimal. 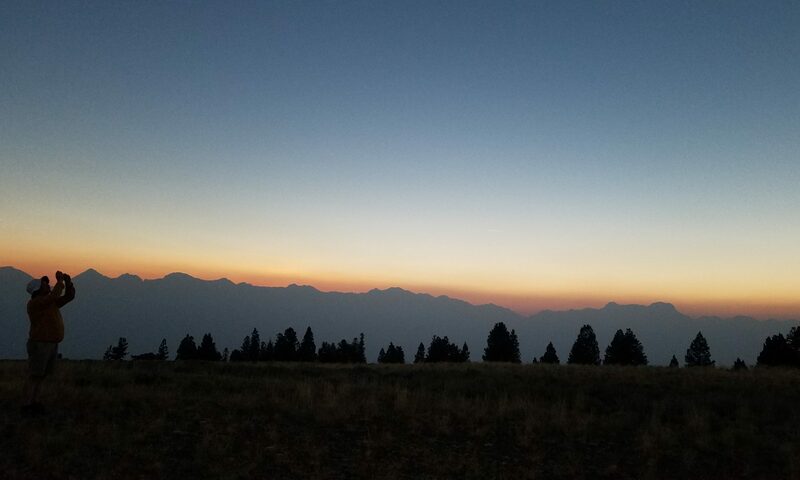 This has led to no lack of quality, as the guidance and support is generated through dialogue shared by a cohort of students – the online community of inquiry. Authoritative sources, journals and textbooks including key professional documents, are available widely on the internet and can be engaged with rigorously, critcially and comprehensively. This way of organising learning is most effective in that it also sets up the student for further lifelong learning. I think not – the e-university did not take a visionary nor innovative approach in my view and was not at all ahead of its time, but tried to take old approaches into new technology with minimal account of growing evidence of the efficacy of new models of online learning. For the sake of my tax bill please lets not try again without considerably more care and wisdom! 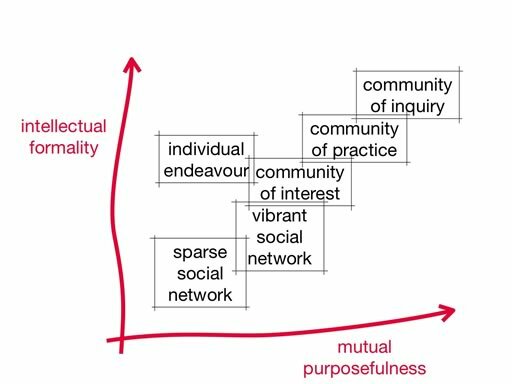 I have enjoyed discussing with colleagues at Manchester University the nature of online community, which made me think about the various terms used – hence the above slide. It was also fun to explain the work done over ten years and how we came across many of the concepts we take for granted. Here are the slides as a PDF file, which miss out on the many videos I showed of participants talking about their experience. 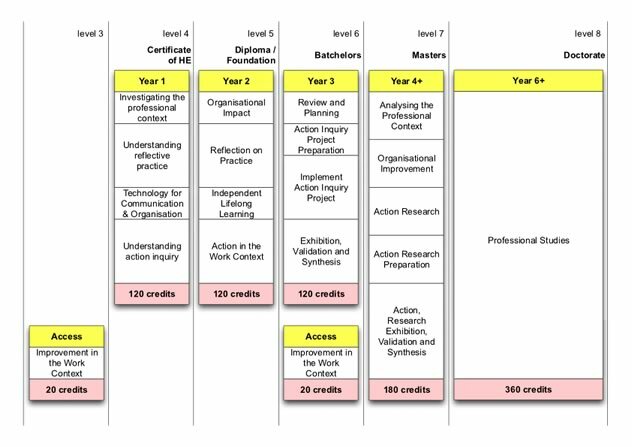 Almost five years to the day that Ultraversity was validated at Anglia Ruskin University, we have received conditional approval for a new scheme based on the same philosophies of learner-centred, work-focussed, community-supported, action-inquiry and innovative assessment. This IDIBL course framework validated at the University of Bolton is more ambitious in scope, more refined in character and draws fresh inspiration from the organisational thinking from its home in the Institute for Educational Cybernetics. We can now begin to recruit in earnest for a Masters course in ‘Learning with Technology’ and follow it up with further courses in Regeneration & Sustainable Communities, Chronic Healthcare and other societal thematic problems which need active and vibrant attention. 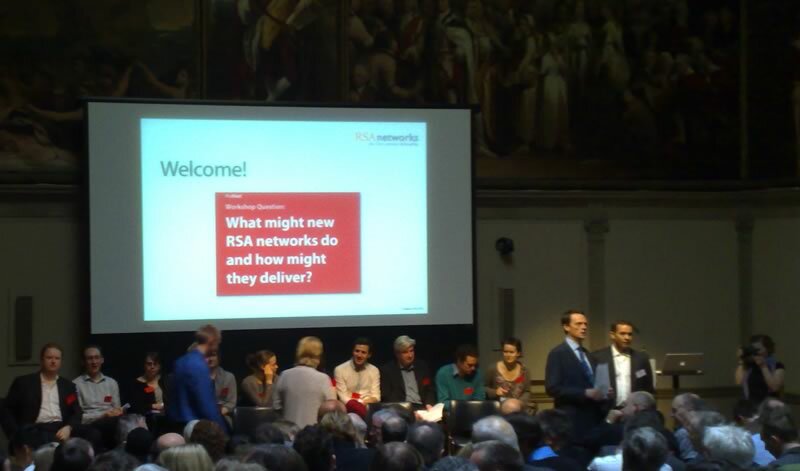 The objective of this workshop was to begin a new kind of RSA fellowship engagement ‘RSA networks’, and to discover what they might do and how they might work. A stimulating ‘Open technology’ format was used to generate, discuss and refine over 70 ideas from the 260 fellows and staff present. Decisive criterion: does it work? Nevertheless I went away feeling that both business and academia (both well-represented in the session) were unhappy with the current state of affairs and the University for Improvement – an idea based on the Inter-Disciplinary Inquiry-Based Learning project (IDIBL) I am working on at the University of Bolton – was well received. As Graham Hill put it: “The best way to connect the world of industry to academia is to people it with students” – something IDIBL will be striving to do. A fascinating evening sitting in the Star Trek-like environment of Talkaoke at the RSA. Discussing the development of an online environment for the RSA Fellows. A wide-ranging discussion which homed in on the confrontation between the trust and shared intent of a closed society and the creativity and diversity of open thinking. A chance to present the IDIBL project and consider its place in RSA developments to become a dynamic force for change by offering a route for those keen to embrace civic innovation in a disciplined and rigorous manner and gain academic qualification at the same time. A day which thoroughly overlapped two intriguing events, but I managed to make breakfast at the RSA for Becta’s Harnessing Technology: Research Forum and then skip across the road to present at the BCS KIDMM MetaKnowledge Mash-up and then back again for the wrap-up session at the end of the day back at the RSA. Diane Oblinger obligingly begged my question, she having identified as three purposes of education: Economic Wealth, Citizenship and Social Mobility. This left me with the opening to ask about the status of Cultural Enrichment and Individual Fulfilment as further aims for education, and how digital creativity might be central to delivering these aims? 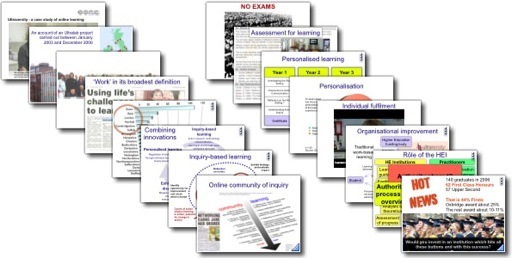 This is the presentation (as a PDF) I have used to promote the innovative Ultraversity project we developed and implemented in Ultralab, Anglia Ruskin University from January 2003 – December 2006. The project’s main outcome was a degree programme which is still recruiting and has had enormous success. In my spare time :), I am transcribing the interviews with Ultraversity graduates at the graduation ceremony in Chelmsford on November 24th 2006. Greta has done the mass of the transcribing, I am editing and very nearly finished. These kind of remarks make me very very proud of our endeavours over the last three years.